Ann Timothy, widow of Peter Timothy, resumed publication of the Gazette of the State of South Carolina, continuing the tradition started by her mother-in-law, Elizabeth Timothy. Peter was arrested in 1781 by the British and transported to St. Augustine for imprisonment during the Revolution. He was “lost” at sea during the voyage from Charlestown. Capt. Joseph Vesey leased two town lots in Charlestown from John Christian Smith. Vesey and his wife lived at 281 King Street, and the other building on East Bay Street, became Vesey’s business office. He set himself up as a ship chandler – an importer and retailer of various commodities including naval stores, rum, sugar and African slaves. To raise the capital for his business, Vesey sold his ship Prospect and liquidated his interest in two other Caribbean slave trading vessels, the Dove and the Polly. Vesey’s trusted manservant, Telemaque (Denmark) enjoyed quasi-freedom in the urban environment of Charlestown. He discovered a thriving black community living an illicit social life in the city’s back alleys, hidden courtyards, street corners and church basements. In the Battle of Sol Legare Island, Union troops attacked the fortifications on James Island and Folly Island, but were repelled by the confederate forces. One of America´s first African American Army Regiments, 54th Massachusetts, organized in the North, fought during the Sol Legare Island battle, losing 14 men. 17 were wounded and 12 missing. This defeat lead to the grand assault on Battery Wagner two days later, featured in the movie Glory which was based on the true story of Massachusetts’ infamous 54th brigade, comprised from the first all-black volunteer company, fighting the prejudices of both the Union army and the Confederate army. 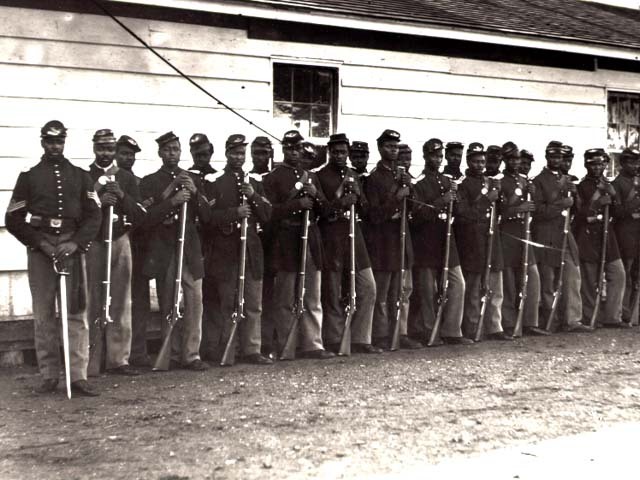 Soldiers from the 54th Massachusetts Regiment.